Fishing on Lake Texoma has been outstanding the past few weeks and continues to be very good. The most consistent action has been on live shad in 40-80 foot water sometimes dropping baits to 70 foot but there is also plenty of fish that can be caught on topwater, swimbaits and slabs. Fish were schooling up real good but the last few days they have just been cruising around in deep water and live bait has been key to catching those fish. Also noticed today that baits were dying faster dropping them down more than 40 feet and that’s a sure sign that the lake is starting to stratify. Catching bait has really been tough the past week, another good reason to hire a guide. Bio: Capt. 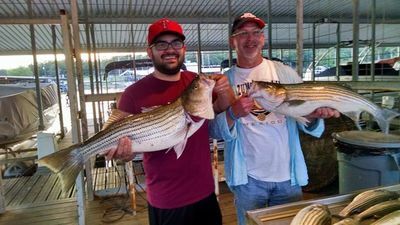 Steve Lake Texoma Striper Guide 24+ Years Experience guiding in Texas Will work hard to put you on fish every time out Licensed Professional Fishing Guide Service Lake Texoma is famous for the quantity of striper so we are able to catch a good amount of fish in the 10-20lb range. We can handle and size group and always work hard to put you on fish. 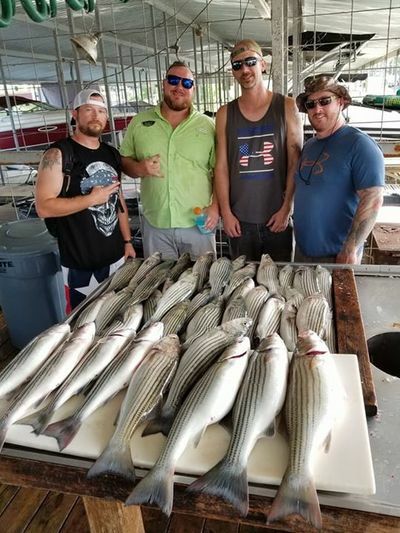 Lake Texoma Striper Guide fishing Lake Texoma with a fleet of big, safe and comfortable 27+ foot boats. We provide all quality fishing gear, tackle and bait. We also fillet and bag your catch. We can handle any size group. Women and children are always welcome. Capt. Steve provides high quality fishing trips at competitive rates. We run one of the nicest best equipped striper fishing boats on Lake Texoma.